PALESTINE – Most block parties result in the cops being called in for noise or raucous behavior complaints … this time, they will already be on the scene. First responders and other women and men in uniform will meet and mingle with the citizens they are sworn to protect on Oct. 4 during the biggest block party in Palestine. The party starts at 5 p.m. and runs until 7 p.m. at this location. First responders, a generalized title encompassing law enforcement, firefighters, EMTs, and other critical careers, is a job defined by inherent danger, long hours away from family, reams of paperwork, and far too often, meeting people under extreme circumstances. “National Night Out is about strangers becoming partners for a greater community. We need to work together to solve the problems in this city and National Night Out is a means to achieve this goal,” Palestine Police Department Lieutenant Gabriel Green explained. Green anticipates a high turnout for the event and personally invited citizens and community members to attend. Among the attractions to the block party are deejays, vendors, food and games. The first 200 people who show up will win a “National Night Out” awareness bracelet. This year’s event marks the fourth for the department and community. “The event has enjoyed great public response every year,” Community Liaison Officer Bernadette Capers said. As the Community Liaison Officer, Capron is one of the movers and shakers behind the event. She credits the community itself and a dedicated team of first responders and PPD law enforcement officers with the planning and success of the event. “The community continues to come out and help support this event,” Capron said. “Walmart provides the hot dogs, Ben E. Keith provides the water, and we use many donations from local businesses as giveaways for the public. “This is my second year organizing NNO, but I do not do it alone. I work with a great committee. NNO is important because it gives first responders a chance to interact with the public,” she said. It’s important, Capron explained. “In most situations, when someone interacts with an officer, firefighter, or EMS, most likely it is during a traffic stop, or when they have been dispatched to your location. “These interactions can be stressful. But during NNO, it is a much more relaxed atmosphere. Everyone is coming out to have fun. You can have a conversation with all first responders in a non-threatening way. “You may have questions you always wanted to ask, but were too nervous. This is the perfect opportunity to do that. “It is also a good way for first responders to thank the public for their support and for the public to thank first responders. Mutual appreciation and understanding are critical, Capron said. “You need both, first responders and public support to make a community a safer and healthier place to live. As the event approaches, both first responders and the community feel the excitement building. 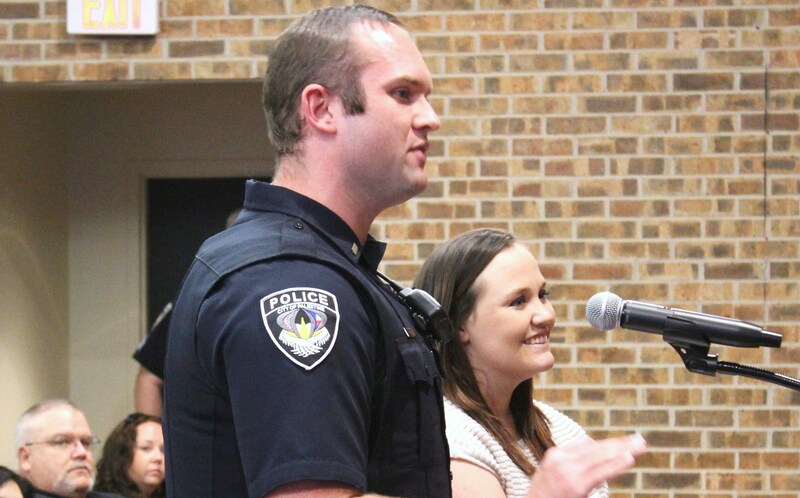 “The Palestine Police Department is very excited about the upcoming National Night Out event,” Assistant Chief John Herod said. “This is a great opportunity for the community to interact with and get to know the local first responders. It is critical for the citizens and the police to work together, collaboratively, to solve problems in the community. “Events like these help solidify our relationships and keep channels of communication open,” he said.